After educators have their goals approved, they will develop a plan in conjunction with their evaluator that outlines a course of action that the educator will take to attain their goals. This Action Plan serves as an opportunity to determine the time, resources, and relationships necessary to accomplish the goal. It also allows educators to anticipate the potential barriers that might impede goal completion. Educators who are on a self-directed growth plan will develop their action plan, and the evaluator will review the plan for approval. Educators on directed growth plans and improvement plans will work more directly with evaluators on writing the action plan, as the educators will have specific prescriptions that need to be incorporated. Educators are expected to keep track of their own progress on their action plan. Evaluators should review and make suggestions to the educator’s action plan if there are potential impediments that the educator doesn’t take into account. The action plans should reinforce the SMARTness of the goals the educator set by establishing steps and benchmarks related to the goals. Action Plan Development works best as a collaborative discussion between evaluator and educator. This allows for conversations that build relationships and a shared understanding of high quality professional practice. 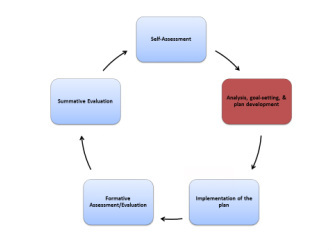 Both educators and evaluations may find it useful to discuss what artifacts can be used to document progress toward goal attainment while reviewing the action plan. Be aware of what professional development opportunities are available to assist educators in reaching their goals. The following introductory activity serves to give you a brief introduction to the specific considerations that an action plan will require. Thinking about a skill or ability that you are somewhat proficient in but have not yet mastered, jot down a quick personal goal for yourself that you’d like to accomplish in the next 90 days. Though you might find it helpful to do so, this goal does not have to be related to teaching. Using the chart below, consider what 3 steps you would have to take to achieve this goal, when each step should be done by, how you will determine whether or not you’ve finished that step, and what challenges may prevent you from getting to those steps. Action Steps – Break your plan down into smaller steps. Write a description of each step in your plan below. Feel free to create more steps than the numbers listed below. Be sure to write a deadline for each step. How will you determine if you achieved this step? What might delay or hinder this step in your plan?